SPACIOUS 5 BEDROOM 3 FULL BATH, BRICK AND VINYL HOME LOCATED IN SAVANNA HEIGHTS. OPEN CONCEPT FORMAL LIVING ROOM AND DINING ROOM, LARGE FAMILY ROOM WITH GAS FIREPLACE. BEAUTIFULLY DONE KITCHEN. HUGE MASTER SUITE. TWO CAR GARAGE WITH ELECTRIC DOOR OPENER. GAS HEAT AND GAS COOKING. OVER 2800 SQUARE FEET OF LIVING SPACE WITH ON A LARGE FENCED IN LOT. BEAUTIFUL IN-GROUND SALTWATER POOL. PERFECT PATIO AND YARD FOR ENTERTAINING. LOCATED ON CUL- DE-SAC. GENERATOR HOOK UP, NO FLOOD INSURANCE OR POA FEES. CLOSE TO INTERSTATE AND GREENBRIER MALL AND EDINBURGH SHOPPING. Ready to visit 228 Castleberry? Request a free property tour! Send me more information about the listing at 228 Castleberry, Chesapeake, VA 23323, MLS# 10240074. 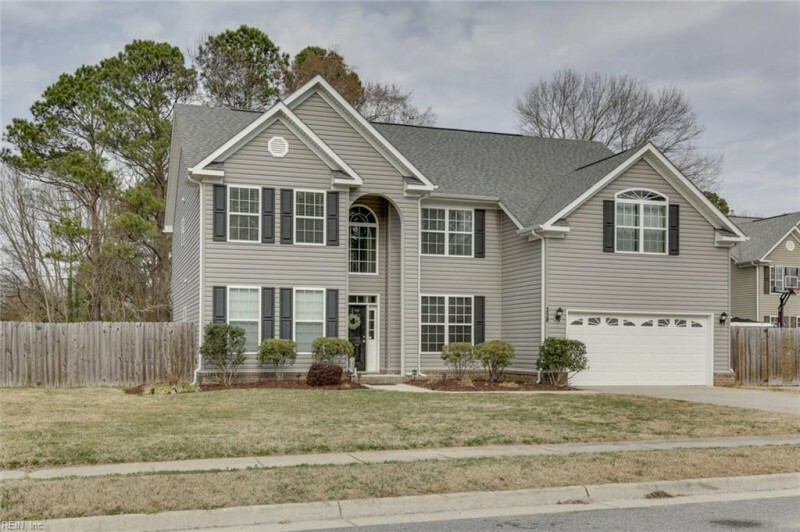 This 5 bedroom, 3 bathroom home located at 228 Castleberry, Chesapeake, VA 23323 has approximately 2,871 square feet. It is currently listed for $440,000 and has a price per sqft of $15,326. This home is currently Sold under the MLS#: 10240074. This listing is provided by Atkinson Realty. 228 Castleberry Drive, Chesapeake was built in 2011. It has Garage Att 2 Car, Driveway Spc, Street parking.The kitchen includes Dishwasher, Disposal, Dryer Hookup, Microwave, Range, Refrigerator, Washer Hookup. 228 Castleberry is part of the Savanna Heights neighborhood located in 23323.